Las Caldas, situated in beautiful countryside, just outside Oviedo, the capital of Asturias, first opened its doors way back in 1776. 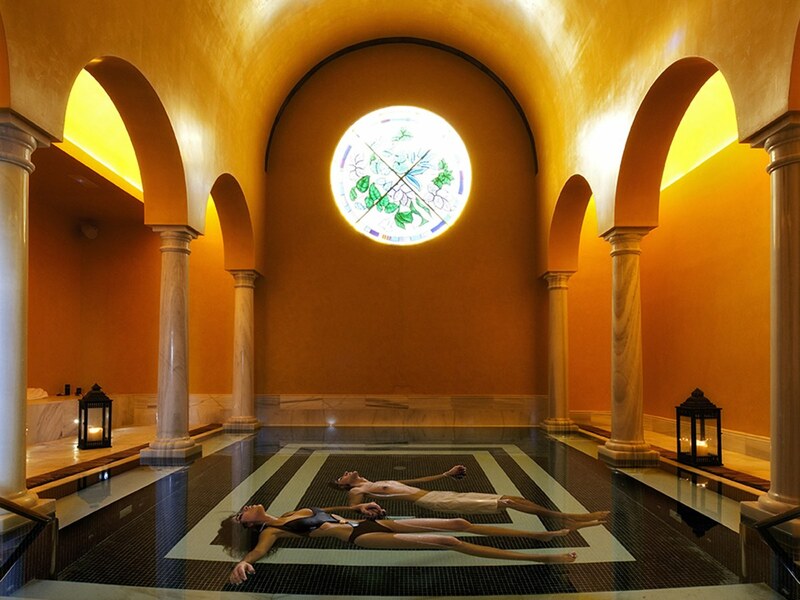 It’s a classic Spa Resort and people have been coming for its healing waters ever since. Its period features were comprehensively refurbished in 2008. In fact there are two separate establishments, on either side of the road, connected by an indoor bridge. The Las Caldas Grand Hotel is the historic part while the Las Caldas Enclave was completed in 2011 and is bang up to date. You choose between classic or contemporary style but the spa and fitness facilities are open to all. This is not just for those couples or singles who enjoy luxurious spa pampering but also for families with children who want to take part in outdoor activities. 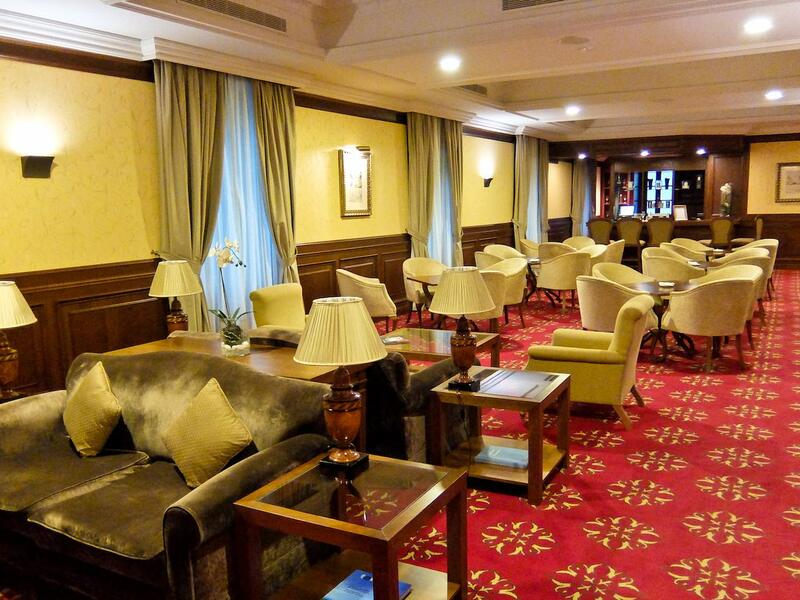 The Grand Hotel has 79 classic rooms. All have double beds or two singles, LCD TV, DVD player, minibar, individual air conditioning, Wi-Fi, safe, bathrobe and slippers and fully equipped bathroom with shower and bathtub. 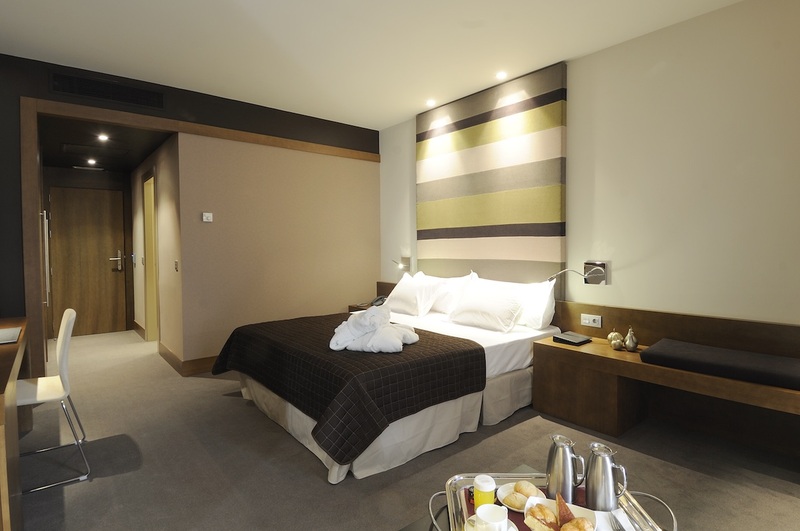 The 77 rooms in the Enclave are more modern and functional but have similar facilities to the Grand. 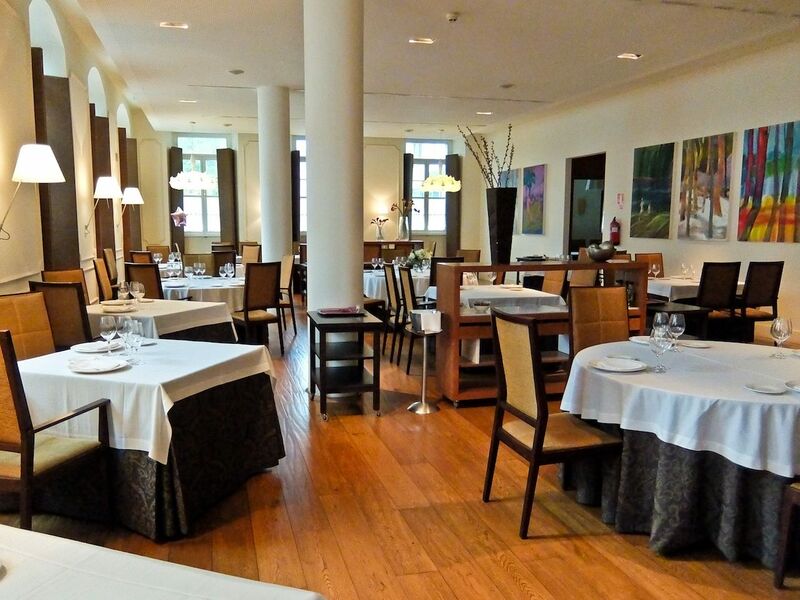 The Viator Restaurant serves high class traditional cuisine in a classic setting. In line with the wellness theme, all products are 100% organic, seasonal and natural. Be aware that meals are served on Spanish time, later than you’d expect in the UK. If you’re feeling peckish then a coffee shop, near reception, serves burgers, salads and sandwiches all day. The Grand contains the historic spa El Manantial, in the 1776 old Bath House, with swimming pools, saunas, steam baths, and relaxation areas. For something more intimate there’s the Columns Hall, built to resemble a Roman villa, where you can relax with your family or small group of friends. The Wellness Clinic focusses on rebalancing body and mind using nutrition, physical exercise and natural therapies. Across the road, next to the Enclave, is the new Sci-Fi Aquaxana spa complex. 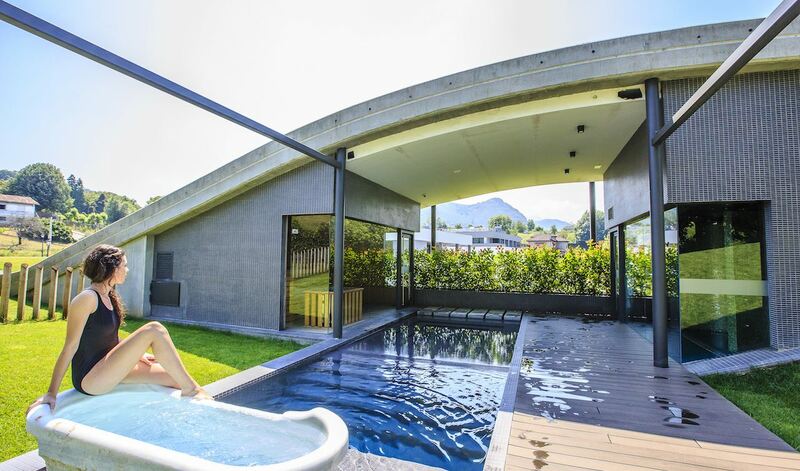 It’s housed in a flying saucer shaped bunker, sculpted into the natural landscape, and features an indoor pool covered by a 15m high dome. Yes, it’s free throughout the property. Water is a feature here and the River Nalón runs right past the hotel, perfect for a kayak trip. Along the banks there are isolated beaches where you can pull up and picnic. Don’t forget to take advantage of one of the natural bathing pools for a refreshing dip. If you fancy venturing further afield, then borrow a bike, but don’t forget the supplied GPS route planners. A popular trip follows the route of an old railway line, bringing you to the centre of Oviedo in less than an hour. Visit the 13th century Cathedral, surrounded by a charming network of medieval streets with shops, restaurants and a huge covered market. Vueling flies direct to Asturias from Gatwick three times a week. 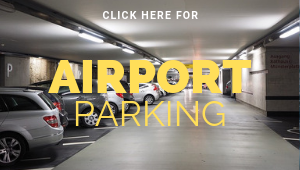 The airport is around 40 minutes from the hotel and they can arrange transfers. 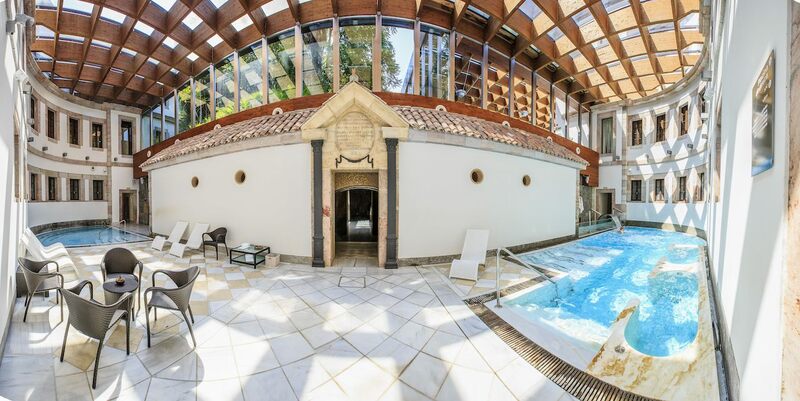 Las Caldas makes a great base for exploring this part of Asturias but, if time is short, just enjoy the pampering in this historical spa.